Since I’m not willing to manufacture my own fertilizer, the big question is what is my next step? I think it might be a pantry clean up – though that’s a daunting prospect. As news of the new food recall (hydrolyzed vegetable protein, or HVP) grows, I’m painfully aware that there is probably some of that gunk lurking in my pantry. Yes, I know the amounts are so small that is unlikely to make us sick – but do I really want to eat it? And if it isn’t this recall that directly affects me, it will just be the next one. I think of myself as a cook-from-scratch kind of person, but, just a casual glance at my kitchen shelves reveals instant noodles, chocolate syrup- the first ingredient listed on the label is high fructose corn syrup, chicken bouillon cubes which contain monosodium glutamate -I read the label and tossed those, and a can of bread crumbs with a list of ingredients as long as my arm -those are gone too. But the news isn’t all bad. I can also see quinoa, steel-cut oats, organic chocolate, organic peanut butter, (ingredients, peanuts and salt) and home-canned apple sauce (thanks, Gwyn). I also worked up the courage to read the ingredient label on my can of green curry paste and am delighted to find I can keep it. I know it isn’t local. Neither is the coffee I’m drinking right now. Nor is the man I married, for that matter. But maybe the prospect of the cleaning up my act may not be as expensive, or depressing as I first thought. I just read an article about the 28-Day-Real-Food-Challenge, and checked out the website of the challenge creator, Jennifer McGruther. I’m not ready for it yet. I’m an abysmal bread baker, (not for lack of trying, either), don’t really want to mill my own flour, and while I like paneer, it doesn’t hold a candle to a good blue cheese, something I know I can’t make on my own. But I’m certainly inspired to move towards a real food diet. I just know I’m not going to be making/growing all that food myself. And I am more than okay with that. I am sure that 95%, or more, of everything we ate for dinner last night was real food. 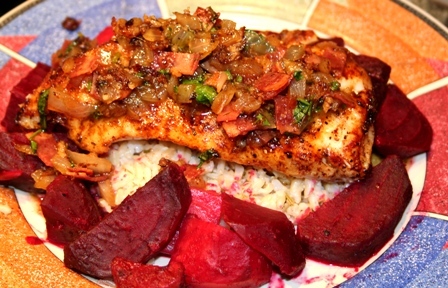 Halibut with Bacon Dressing and Roasted Beats, from Eat Magazine. 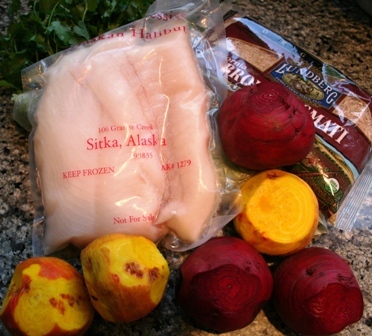 I made the recipe with organic beets (California), halibut that my cousin caught in Sitka, Alaska, and brown basmati rice (California). The two dubious ingredient were the “all natural” turkey bacon, and sadly, the prepared horseradish, which I just discovered contains high fructose corn syrup. I’d rather there be less mileage on my produce, but I think that’s achievable. I’ll post the full results of my pantry cleansing next week. In the meantime, if you’d like to be inspired, check out “Mission Sustainable” – the pilot for a reality TV show that was created right here in Seattle. The food portion of the segment inspired me to face my own pantry. I can’t wait to see your next post- I see I have some reading to do. Maybe this will help me in my quest to avoid Nacho Cheese Doritoes and their evil cohorts. I will cross my fingers for a bumper tomato and apple harvest for my canning this year. Now I just have to move to the Northwest so what I can will count as ‘local’, too.